adidas is offering the Men’s Original Stan Smith Primeknit Shoes (Core White / Chalk White / Fairway) for $55 shipped today. 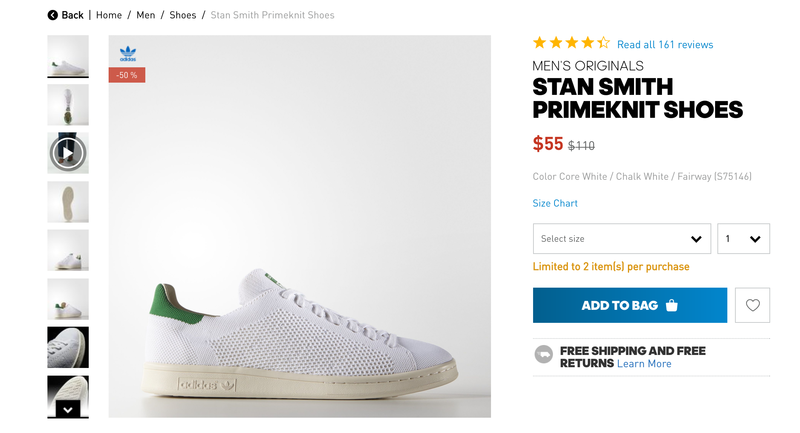 That’s $55 under the original listing and the best price we can find on authentic Men’s Primeknit Stan Smiths of any kind right now. Similar models start at around $70 on Amazon. You can try signing up for the adidas newsletter to get an extra 15% off your first purchase (link in upper right corner of this page). Details below. A legacy adidas look, the Stan Smith gets a modern update with an adaptive adidas Primeknit upper. These men’s shoes serve up the same crisp, clean style with a contrast heel tab and the authentic off-white rubber cupsole.